Going back 50 years ago, Khao San Road or Khaosan Road (ถนนข้าวสาร) in Bangkok Thailand, was locally known as a good place to buy rice and home to one of Bangkok’s largest rice markets. The name Khao San actually means ‘milled rice’ in English and was given to the road for it’s historic link to the rice trade. During the 70’s and early 80’s cheap guest houses, digs and bars started to appear. The first place to open was a small hotel for civil servants visiting the area on business from other provinces in the kingdom and shortly after was a shop which sold Monks’ accessories called Sor Thambhakdi. Over time other similar places opened and the street then become known as a ‘religious street’. Then in 1982 the first commercial guest house opened called ‘Bonny’, the guest house had six small bedrooms and it would set you back 20 baht for a night stay and a meal. Today the price of a night stay in a cheap guest house can be anything from 200 baht to 1500 baht. Khao San Road is now the historical centre of the wider tourist area which has developed in the Banglamphu area of the Phra Nakhon district of Bangkok. 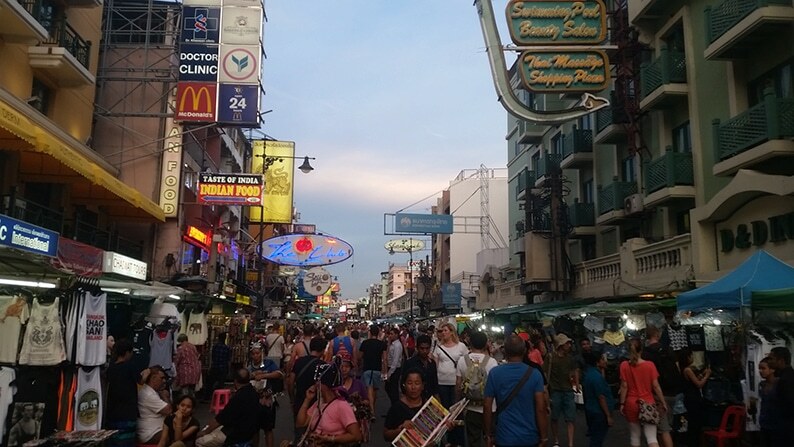 Although Khao San Road was originally catering primarily for backpackers and described as the backpacker Mecca back in the 90’s and early part of this century, this tag doesn’t really apply anymore and you’ll see people from all walks of life enjoying the buzzing atmosphere of this truly amazing place. The famous Khao San Road is visited by millions of people each year, many of whom are not backpackers, nowadays you will see people from all over the world, including backpackers, expats, tourists and holidaymakers all enjoying what this truly unique, vibrant place has to offer. From what once was a major rice market area, the road has now been transformed into an urban hive of tourist activity and a special place which draws people back time and time again. Khao San Road is located in the Phra Nakhon district of Bangkok in an area called Banglamphu. Khao San Road or Thanon Khao San is a 0.5km long road in Bangkok, close to the Khao Phraya River and lies just 2.6km north from the Grand Palace, Wat Phra Kaew and Wat Pho. Click on the Khao San Road Map tab (above) to familiarise yourself with the area. Getting to Khao San Road is easy to do from anywhere in Bangkok. The main options are express boats, busses and taxis. Unfortunately the BTS (Sky Train) and MRT (Metropolitan Rapid Transit) do not reach the area of Banglamphu, the closest BTS stations are Ratchathewi on the Sukhumvit Line and National Stadium or Siam on the Silom Line all of which are around 5km away. The closest station on the MRT is Hua Lamphong, again around 5km from Khao San Road. So if you are travelling into Bangkok by BTS or MRT you will need to get a taxi or Tuk Tuk which will be about a 15-25 minute drive, depending on traffic. To find out how to get to Khao San Road from your current location, click on the Khao San Road Directions tab (above) to see the best possible route and ways to get there. Firstly enter your current location, click on Get Directions and then filter by means of transport, by Car, Public Transport and by Walking. Your directions the Khao San Road will then be displayed below and the route will also be shown on the map. TIP: The Map & Directions feature is available on all places, things to do and hotels throughout the Thailand Travel Hub site. For example, if you want to find out how to get to the Grand Palace from Khao San Road click here to reach the Grand Palace page, click on the Map & Directions tab, enter your location (i.e Khao San Road), preferred method of transport and your directions and route map will be displayed. The only way to really explore Khao San Road is by foot. If you want to go slightly further afield there are plenty of eager tuk tuk drivers around at either end of the road. When taking a Tuk Tuk remember to agree a price with the driver before setting off. There’s also a steady stream of taxis coming and going. When it comes to taking a taxi, always insist that the meter is on. Khao San Road offers cheap accommodation ranging from budget hostels to 3-star hotels. It’s also home to many budget guest houses, Internet cafes, restaurants, lively bars and clubs as well as massage parlours. Packed into this strip are bookshops, tattoo shops, travel agents, market stalls and street vendors selling everything from noodles to curries, rice and coconuts. With its relaxed atmosphere and carefree attitude, Khao San Road is quite unlike anywhere else in Bangkok. It’s a great place to hang out, popular with the friendly locals, travellers and holidaymakers. The area has a party spirit which spills over into nearby Soi Rambuttri. Khao San Road is where East meets West, there’s something on every corner. Here you can find sleek clubs playing the latest sounds, electric market stalls converted into modern cocktail bars, rickety wooden Thai bars selling cheap booze and fast food outlets catering for Westerners. The place has soul and a raunchy, gritty charm about it which makes it so famous. 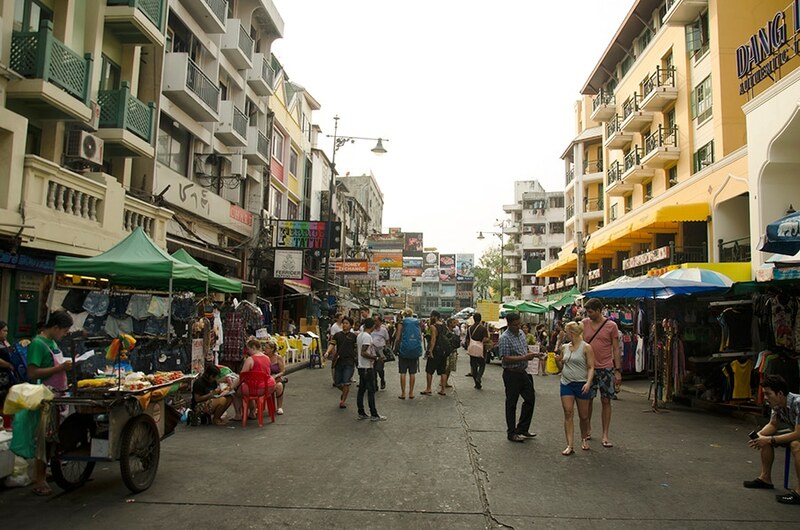 Some people have labelled Khao San Road as a backpacker ghetto which is a little unfair. 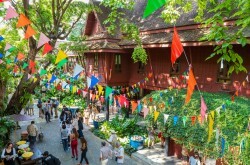 There’s still plenty of variety and history especially North of Khao San where you can find quaint old streets that meander up towards Dusit. A stone’s throw away to the South of Khao San is one of Bangkok’s most famous roads, Ratchadamnoen. This was built by King Rama V in 1899 to connect the Grand Palace to Dusit Palace. 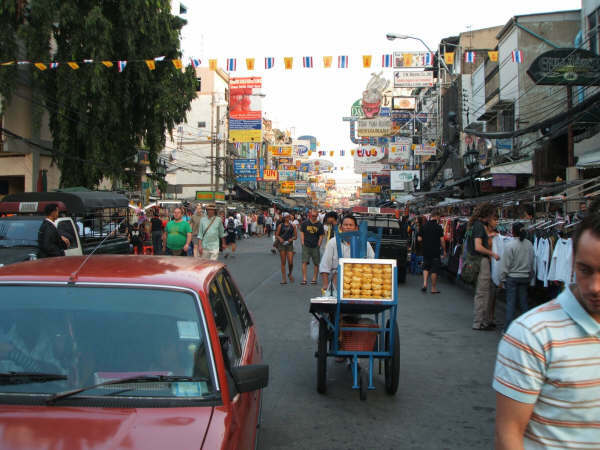 Many people choose to stay in Khao San Road for its great location. There are lots of easy to find internet cafes, laundries and beauty salons. Many ATMs can be found here so you’ll have no problem exchanging money. Love shopping? How about buying bargain watches, sports tops, shoes, denim jeans, handicrafts and souvenirs at the day and night shopping bazaars? After shopping, sit back, relax and watch the world go by at one the many street bars. Try Thai cocktails like Passion Fruit Caipiroska, Siam Mary, Tom Yum Siam or Lancastria, lychee vodka, martini with lemon. Khao San Road Bangkok really is a major tourist attraction in its own right. Hungry and want something to eat, no problem. How about trying delicious Pad Thai with spring rolls, Indian curries or Western cuisine? 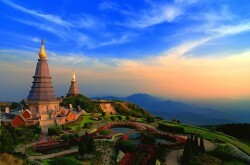 Khao San is also within close proximity of classical and cultural attractions. 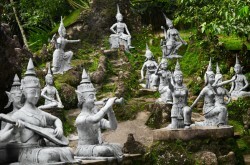 Take a walk from Khao San to Phra Sumen Fort. The fort was built around 200 years ago to protect the city. Explore the temples along the banks of the Chao Phraya River such as Wat Arun and Loha Prasat, then take a cruise down the river in a long tailed boat. The neighbourhood comes alive at night. Enjoy street performers, nightclubs, food hawkers selling barbecued insects, exotic snacks and locals flogging Ping Pong Shows. This type of show is a form of stage entertainment which takes place in nearby strip clubs, not for everyone, but you are a group of young travellers your sure to get asked by a tout, just remember it’s not for the fainthearted. Locals and tourists like nothing better than dancing and partying the night away into the early hours, Khao San Road is definitely the place to be. 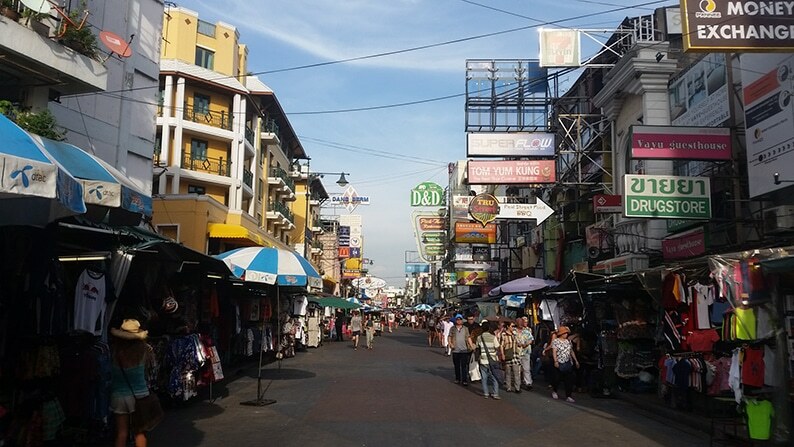 Been to Khaosan Road recently? leave a review below and let us know your experiences. Great starting place for backpackers travelling around Thailand, lot’s of cheap accommodation there and a good place to meet other like-minded travellers.